Meet with your guide outside Manchester Central ( or any other convenient city location) , before boarding your coach for this 4 hour tour of the Manchester Highlights by coach and on foot Throughout the coach tour your guide will give you a commentary and explain the history of the City and the sights. There will be stops made at some of the key attractions where you will leave the coach for a more detailed showing. 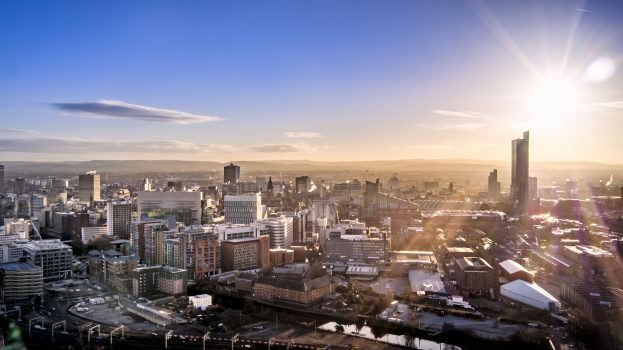 The tour showcases both the historic buildings of the City as well as the more modern face of Manchester. The tour will include outside views of the following: Whitworth Gallery, Old Trafford Stadium (home of Manchester United), Imperial War Museum, Salford Quays, Ordsall Hall, Castlefield, Museum of Science & Industry and Central Library. On arrival back in the City Centre the tour will continue on foot exploring parts of the City that are inaccessible to the coach. You will be split into groups of maximum 25 persons to each guide, to ensure that you get the best out of the tour. Your guide will introduce you to the City from its humble origins and its rise as a main textile trading town, and its growth during the Industrial revolution. You will see China Town, The Town Hall, the Manchester Art Gallery, St Annes Square and the Royal Exchange. You will have chance to see inside John Rylands Library, and the new development at Spinningfields, together with Manchester Cathedral and the National Museum of Football and the Midland Hotel. attractions, however there is no additional charge for this.